NOTE: This is an old article, to read the continuation of this article in current market scenario please click here. On 20th January, 2015 Nifty closed at historical highs of 8695.6 and a P/E of 22.16. Generally a P/E of above 22 is considered as overbought zone by many and they start all doomsday predictions. In this article, we shall try to understand the valuations and what they say about the current rally. EPS, P/E of Nifty will be used to understand the valuations. Rallies in market are either judged on rising EPS or P/E expansion. When P/E is expanding it means that the investor's sentiments are getting more bullish and the expectations are of faster pace of growth than what it is currently. What is this rally backed on? For earnings to pick up and go above 15% growth rate it will still take atleast 1 year and even that is something not sure. Till that happens we can expect Nifty to sustain above 20 P/E valuations. What will be interesting to see is will Nifty touch 25 or 28 P/E. If it does touch by then, how much will EPS grow? Average P/E of Nifty is around 18.42 and currently Nifty is around 8700 levels. So investors are expecting an EPS of 475 levels in a year which means an expected growth of 17.3% however, the current growth is around 11%. Will EPS growth rise to 17% is anyone's guess. Just because Nifty is above P/E of 22 doesn't mean that the market will crash, infact some of the wildest rallies have come at these levels of valuation as optimism of investors crosses all rational thinking. As mentioned above, historical trends could see Nifty touch 11,200-12000 levels also! 7800 level will be a crucial level to watch as the 20 P/E is a buying zone in bull markets. 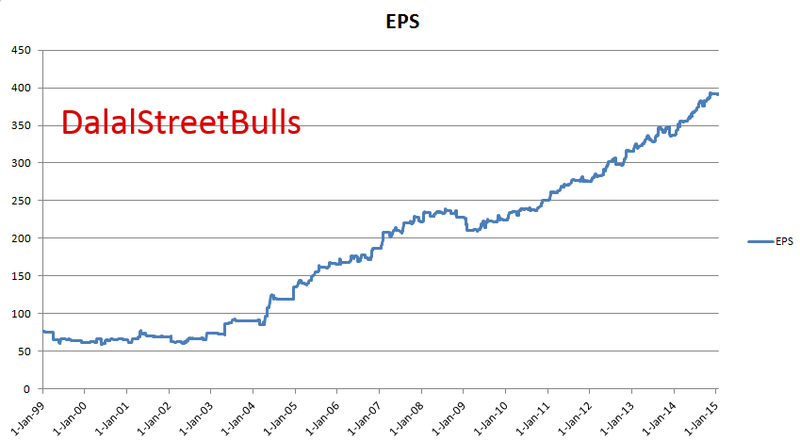 EPS is not growing and P/E is expanding. The market can remain irrational for long as the above table shows, between Jun 2007 to Jan 2008 the P/E rose from 20.5 to 28 and earnings barely grew 9%. If earnings don't show signs of growth in coming quarters, the market could correct significantly by 15% to 20% till 7300-7500 levels. If you are holding stocks with excellent fundamentals then buy on dips; stocks that you are holding for turnaround stories, other bull market stocks should be liquidated at higher levels and sit on cash. This market is ripe for momentum trading. To read more about using PE scale to decide where to invest click here. It is very risky to take BUY/SELL decisions based on just P/E. NSE doesn't release the conslidated EPS and thus the consolidated P/E is not known. The consolidated P/E is usually lower. As we said, use this market for momentum trading.